San Francisco is reputedly the second-largest dance community in the United States after New York. What SF lacks in the number of ballet and modern dance companies, it makes up for in the sheer variety of ethnic dance troupes. We have been fortunate for over forty years to be the home of Chitresh Das, the internationally esteemed Kathak dancer who established the Chitresh Das Dance Company and the Chhandam School of Kathak in 1980. On Sunday, March 18, in Samsung Hall at the Asian Art Museum in San Francisco I caught the world premiere of Das’s Darbar, jointly presented by the Chitresh Das Dance Company and the Asian Art Museum to coincide with the current special exhibition, “Maharaja: The Splendor of India’s Royal Courts”. Hopefully in the future more museums will see the benefit of combining art and dance to enhance the experience of seeing visual art using both static examples and bodies in motion. 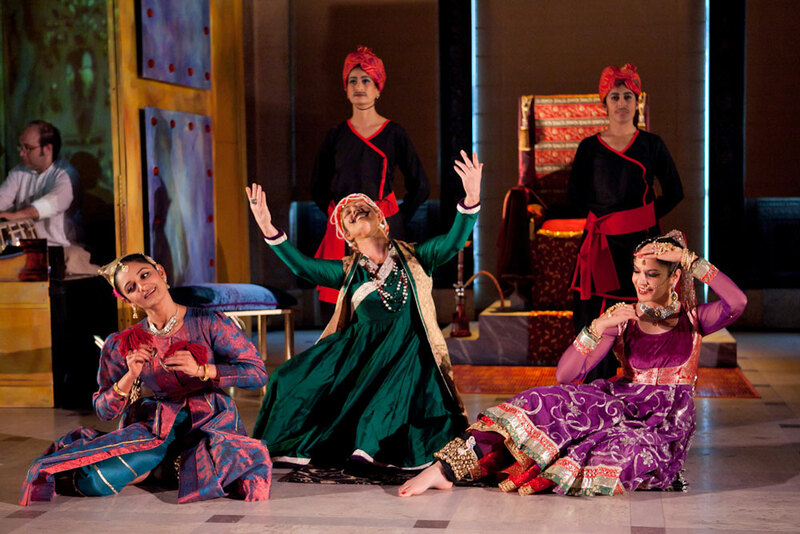 Das has always had a broad, innovative artistic vision and is not locked into merely reproducing classical Kathak dance. In 2003 his East as Center, a retelling of stories from the Sanskrit epic, the Ramayana, won a Special Award for Excellence given by the Isadora Duncan Dance Awards. Here he brought together masters of North Indian Kathak, South Indian Kathakali and Balinese dance, in a juxtaposition of styles that clearly highlighted their differences yet erased the borders between them, showing how many Eastern cultures have their own versions of the Ramayana. More recently Das has been touring with tap dancer, Jason Samuels Smith, in a virtuosic display of friendly rhythmic rivalry and collaboration that transcends style and tradition. Entering the performance space, formerly the Great of Hall of the Main Public Library, I am amazed by lighting designer Matthew Antaky’s layered scenic projections that create a stunning Indian palace on the detailed marble walls in complete harmony with the magnificent soaring ceiling above. 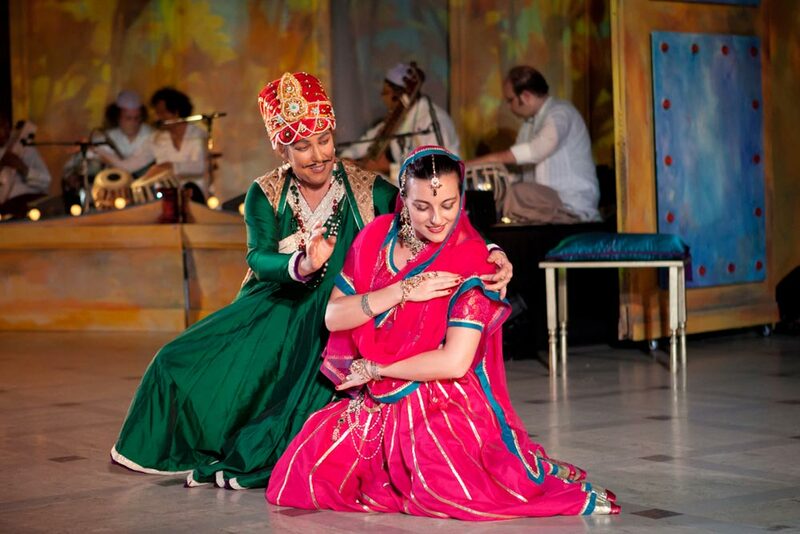 In Darbar (translated as The Court) Das says, “I am able to talk about power, politics and art through the tradition of Kathak, of movement and dance, of costumes, of finding what happened in India in the 1700s and 1800s that is relevant to modern audiences. 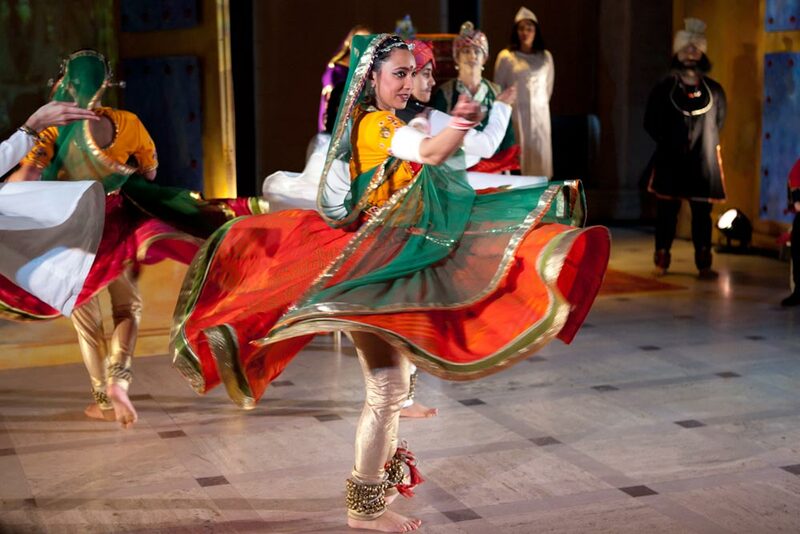 Just as the Maharaja exhibit explores the power and dynamics of the maharajas, the art of Kathak reflects that history and brings it alive for the modern audience. ” Das has definitely succeeded in realising his intent. Darbar tells the story of a king whose obsession with his own indulgences blinds him to the approaching betrayal of his own general. His neglect of his duties to the court and his subjects allows the British to take over. Amidst the swirling silk costumes and glittering jewels, I was impressed with many of the dancers in this all-female cast, but Rachna Nivas as the Queen and Rina Mehta playing the male role of the Guru particularly stood out. The make-up for the male characters could use a more professional touch to make it more convincing, instead of being slightly comical. The Chitresh Das Dance Company also has a history of employing live music whenever possible and frequently brings together the finest Indian musicians. In many non-Western traditions, music and dance are entwined in an artistic symbiotic relationship, feeding off each other. Once again the music ensemble is not just an accompaniment, but a vibrant partner in this performance. In order to accommodate the risers for the audience and the platform for the musicians, there was too little room left between the dancers and the audience. The result was that the lower half of the legs were obscured from view, except to those in the front row. It is a sacrilege not to be able to see the entire body when viewing Kathak dance with its intricate rhythms of the feet. Given the high technical and artistic level of the principal dancers I was disappointed at having missed the whole picture. I am hoping that this latest creation from Pandit Chitresh Das can be shown in a theater with better sight lines so that we can capture all the sparkling facets of this production. A well-written review, stunning photographs. This review lets me know I should not have missed this performance. However, I saw the exhibit. The great wealth and splendor of India’s royal courts was beyond the reach of most people then as well as now. However, the glory and splendor of dance goes beyond the social boundaries and can be enjoyed by all. I so wish I could have seen this performance but feel I got a very good idea from the well written review. I recently saw dance outdoors in Udaipur so could almost imagine being in India reading this. Great photos too.